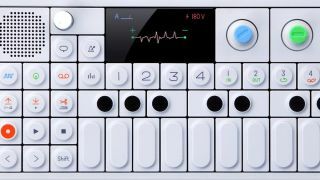 Teenage Engineering say it's been a while since the last update, but the Swedish firm has announced a slew of upgrades in the latest OS for its flagship synth, the OP-1. The upgrade is free and adds some user requests, as well as introducing a number of completely new features. The headliners are the addition of an arpeggiator sequencer and a new synth called Voltage. Voltage is a new synthesizer engine which uses multiple interconnected oscillators. It can produce a wide range of sounds, from basses to organs to pads and more. Arpeggio is a new arpeggiator sequencer that you can use with drums, synths and samples. More of its features are explored in the video below. The update also includes expanded synchronisation capabilities to allow simple syncing of the OP-1 with TE's Pocket Operator range, also adding flexibility for connecting to other gear. As well as outputting a dual-mono signal for syncing the PO modules together with the OP-1, there is also a 16-note sync mode for hooking up to Eurorack modules. The firmware update is available for free and can be downloaded from the Teenage Engineering website.